Don't face reality. 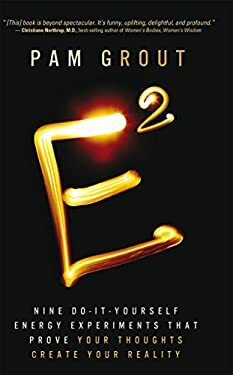 Create reality "E-Squared" could best be described as a lab manual with simple experiments to prove once and for all that reality is malleable, that consciousness trumps matter, and that you shape your life with your mind. Rather than take it on faith, you are invited to conduct nine 48-hour experiments to prove there really is a positive, loving, totally hip force in the universe. Yes, you read that right. It says "prove. " The experiments, each of which can be conducted with absolutely no money and very little time expenditure, demonstrate that spiritual principles are as dependable as gravity, as consistent as Newton's laws of motion. For years, you've been hoping and praying that spiritual principles are true. Now, you can "know. "" E-Squared" proves the following: 1. There is an invisible energy force or field of infinite possibilities.2. You impact the field and draw from it according to your beliefs and expectations. 3. You, too, are a field of energy. 4. Whatever you focus on expands. 5. Your connection to the field provides accurate and unlimited guidance.6. Your thoughts and consciousness impact matter. 7. Your thoughts and consciousness provide the scaffolding for your physical body.8. You are connected to everything and everyone else in the universe.9. The universe is limitless, abundant, and strangely accommodating.